Introduction: Anyone who has fished in horrible weather knows that it can be a very miserable experience. The problem is that no matter how good of fishermen we are, we cannot control the weather. The best thing we can do is to try and cope with mother-nature, and to be prepared for whatever she might throw at us. In looking for an all weather outer jacket, there are a number factors you should consider. For those who want to conquer the elements to fish, Simms introduces the Gore-Tex Guide Jacket, designed to keep you warm and dry on the river while others will be running for shelter. Impressions: At first look at the Simms Guide Jacket I couldn�t help but notice its high quality construction. The jacket is comprised of Gore-Tex XCR fabric, which is 25% more �breathable� than traditional Gore-Tex materials. Many jackets can keep you dry from the outside elements, however this jacket allows your body�s sweat and moisture to escape, thus keeping you drier longer. 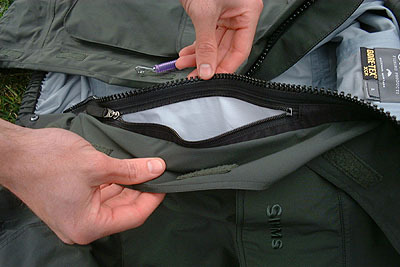 The main zipper is so big and strong, it looks like it should belong on a wetsuit, not a fishing jacket. Anyone who has ever had a zipper break knows that this is a big plus. As far as storage is concerned, I am still discovering hidden pockets that I didn�t know the jacket had when I purchased it. You can actually fish with all your gear without having to wear an outer vest. A large back pocket can also come in handy for storing extra layers, or whatever you wish. Real World Test: There are 2 features this jacket has that will absolutely amaze you. First is the two built in retractors that can hold your pliers and clippers. You won�t have to buy those cheap after-market retractors that put holes in your clothing. These retractors also hide when not in use. Second: Watertight stretch Gore-Tex cuffs that adjust to cinch around your wrist. This minimizes water entry when casting, and landing big fish. 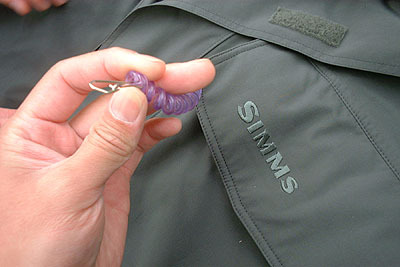 Simms patents both of these features, so don�t expect to see them on any other jacket. The roll-up storm hood, and waist drawstring are a couple of nice finishing touches that put the final signature on the coat. 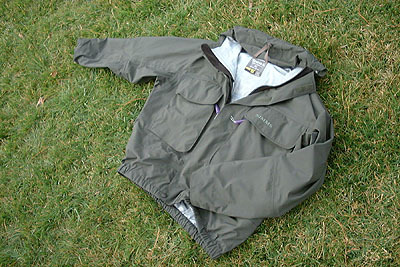 I have used this jacket in the pouring rain, with only a small thermal layer over my skin. The result was that I fished all day while I saw many other people heading for their cars. They looked at me like I was crazy for staying on the river, but little did they know the environment wasn�t effecting me like it was them. At the end of the day I had a fantastic fishing experience, landed fish on waters that normally would have been under higher pressure due to more anglers, got great pictures, and still went home dry. The Simms Guide jacket not only shielded me from the elements but allowed me to keep fishing, and not just salvage a day of fishing, but make it a great day out...regardless of the weather. Conclusion: If you fish all seasons you may want to consider this jacket because it is the benchmark for every other waterproof jacket. However, if you look outside to see if it is a good day for fishing, you might want to consider other choices. This jacket will allow you to minimize your internal layers, and stay as dry and warm as ever. When conditions are lousy, you will stay comfortable. 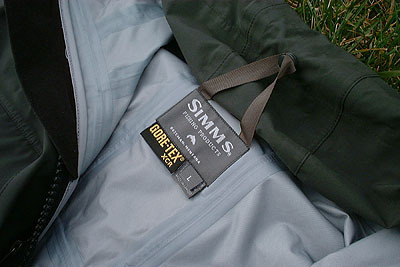 If you are wearing the Simms Guide model Gore-Tex jacket when conditions are lousy and the bite is on, you will probably be the only person on the river....and ultimately, the only one landing them.